Beef. It’s definitely NOT what’s for dinner! At least in today’s preview of a new card game recently launched on Kickstarter. If you prefer free range, grain fed hamburger, you may run screaming from this livestock! I mean, I know all about the controversy over growth hormones, but these cows take it to a whole new, freaky level. Should your rope this one in? Or ride right on by? Read below to see if Monster Moos is a good fit for you. Monster Moos is a light, set collection game with a healthy dose of luck and a sprinkling of strategy. You’ve heard of mad cow disease? Forget about it! You and 1-3 other cryptozoological cowboys will ride some alternate, dimensional range rounding up Dragon Moos, Cyborg Moos, Zombie Moos, and Ghost Moos. I don’t recommend tipping these babies! Your goal is to rustle up a herd of twenty-five cryptid bovines – or even better, you can try managing a herd of fifteen alike to establish a, um well, pure breed, for what it’s worth. I wouldn’t bother with branding, though. The iron’s likely to go right through the ghosts, it won’t phase the cyborgs and zombies, and you’ll just tick off the dragons! 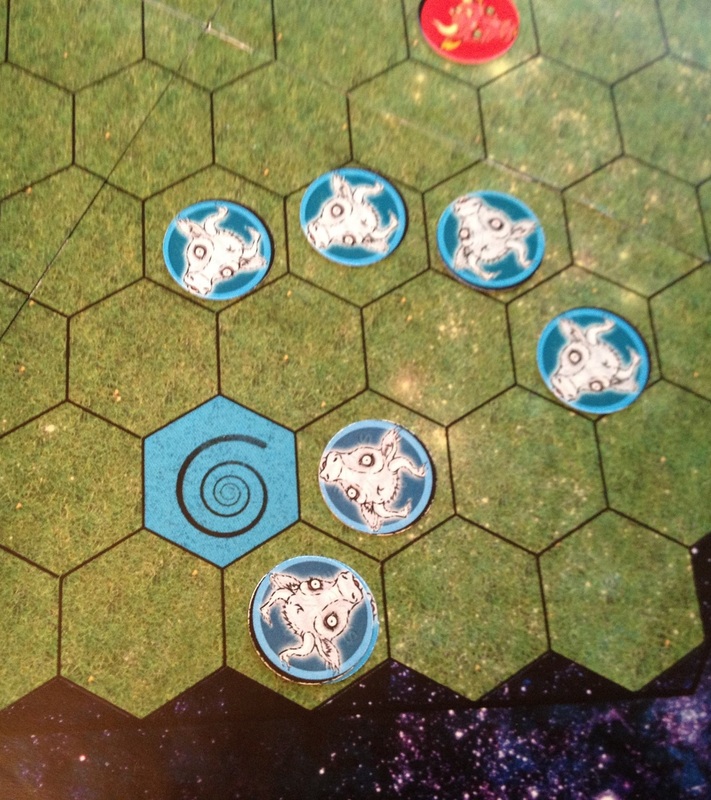 The game begins with one moo token of each type placed to its corresponding portal on the field. Each cowboy is dealt five cards and the remainder comprises the draw deck. 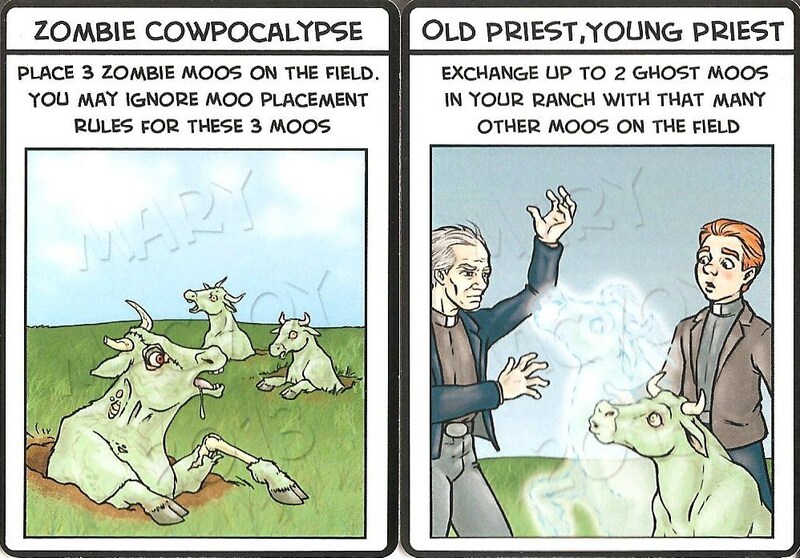 Cards are either tools (collected to wrangle cows), wilds (used as any color tool), or actions (for special effects). The moo dice, with two black sides and then another for each color of moo type, are kept handy nearby. All other moo tokens are placed off-board until called into play by the portal dice – sort of a stargate for ranchers, I suppose. 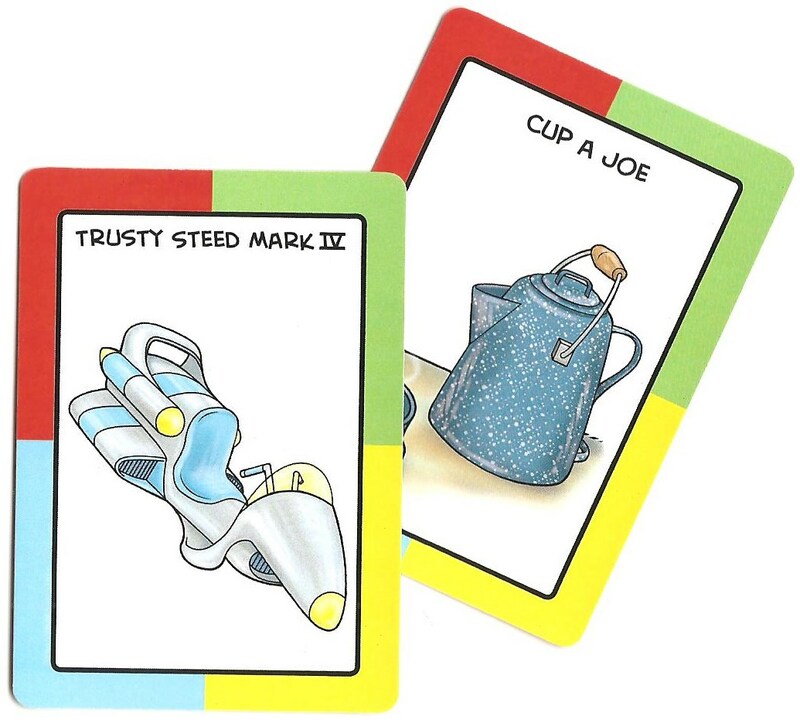 Tool cards – collect 3 of the same color to wrangle the corresponding herd. Game play is strictly structured and fairly simple. On your turn you will first draw. You can take the top two cards from the deck or you may instead pick up the top one from the discard pile. Next, you play any cards from your hand that you wish and are able to, and in any order. You can play three cards of the same color, or with a combination of wilds, to wrangle a herd of matching type from the field. A herd is one or more moos of the same breed in continuous adjacent hexes. You can also play any action cards that you’d like. Alternately, if you do not have any cards to play, you can opt to “sit-a-spell.” In that case, you may discard any number of cards from your hand and draw that number as replacements. You may not do this after playing anything, nor may you play cards after sitting a spell. After playing cards, you’ll manage moos on the board. First you’ll roll the moo dice and add moo tokens according to the results. If you roll all black, the moos stampede, every drover’s nightmare! All tokens are removed from the field and one of each is added to the four portals, as in the game set-up. When placing new beasties, they must either be placed on their specific portal or next to its own kind already in the field. If you cannot legally place the necessary tokens, another stampede results; and that just ruins those plans for your night out on the town at the end of the drive. Finally, you end your turn by moseying – and that doesn’t mean you, cowboy. No, in this phase you will move one of each breed of moo one hex space, if possible. Always remember, however, that a moo cannot wander off alone (unless it began that way), nor may it move in a way that leaves another of its kind by itself. I guess these inter-dimensional, cud-chewing ungulates are more socially considerate than their boring, modern-day cousins. Monster Moos is simple, light, and quick. Each turn you draw cards, play cards, roll and place moos, and then move up to four tokens on the board. Straightforward and cleanly structured, this breezy card game is accessible to young kids. Indeed the designers clearly state that that was one of their main purposes in making Monster Moos. They certainly succeeded. My 5-year old daughter is able to play largely on her own. The only help she requires is in reading the action cards, but she already has a few of those memorized after a few sessions. Wild cards – old school and new! However, the greater achievement here is that Monster Moos is family friendly in that parents will actually enjoy playing with their kids. While set collecting is not particularly filled with decision-making moments, it is nonetheless a painless and popular mechanic that many adults understand and appreciate, especially card players. When you add special, rules-breaking action cards to that core component, it allows for some fun twists and even opportunities to finagle things to your benefit. In addition to that, the second half of your turn is surprisingly tactical. You want to be careful placing and moving moo tokens so as not to create a ginormous herd that sets an opponent up for a big haul. Yet you don’t want to completely break up all of the herds so as to limit your own rustling. Not to make it sound more than it is. You’re certainly not Napoleon marching across Europe. But there are a couple elements that require some thought, which is a wonderful step up from mass market children’s titles and will introduce your kids to some basics of more sophisticated hobby gaming. Managing herds – breaking them up can limit your opponent’s wrangling. The theme also helps engender a kid friendly nature. I almost typed that with a straight face! But still, it is true. I mean, any subject could have been slapped onto this game – so kudos for being creative. Most kids can get into cowboys – even some adults. Playing space cowboys riding inter-dimensional prairies rounding up undead steers is even better. 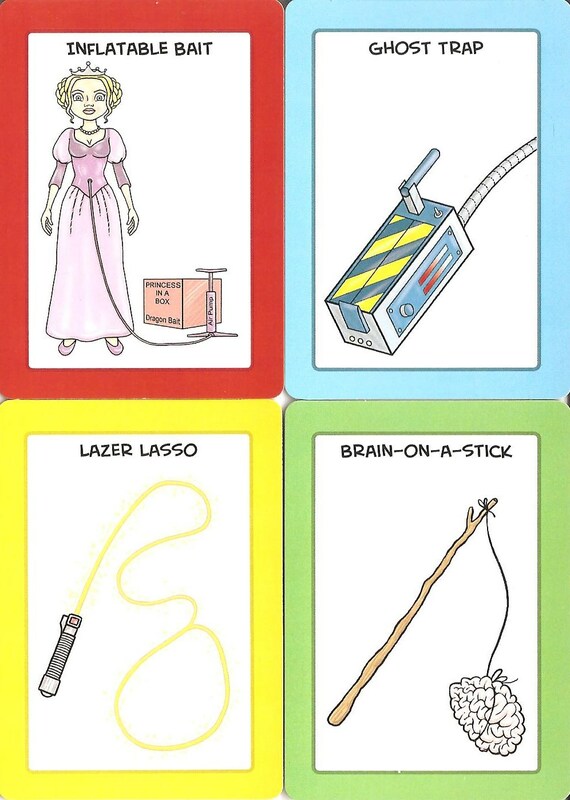 The tool cards include some silly and whimsical thematic references with a dose of humor that actually works. There’s the “boom stick” to battle zombies, a “techno screwdriver” to deal with cyborgs, and the ever effective “holy water” to handle ghosts. Then again, my 10-year old boys’ favorite tool is for attracting the menacing dragon moos – the princess doll inflatable bait. I wonder if I should be concerned about that? Despite the action cards and tactical nature of placing and moving moo tokens, the game is still quite random. Not only do you have luck-of-the-draw inherent with any card game, but the type and number of moo tokens making it onto the field is dependent upon the portal dice. Again, I don’t want to mislead by appearing to glaze over one of its more prominent characteristics. This is no gamer’s game, nor will it likely see the table at any grown-up game night. I do not have an issue with the randomness. Considering its target audience, a healthy dose of chance is not only appropriate, but a great equalizer between young and old. Plus the game plays in about 20 minutes or less, so any bad luck will not be unduly excruciating. That said, if some more action cards had been included to increase tactical options and player interaction, this title could have served perhaps as a fun little filler for more serious hobby gamers, as well. Action cards mix things up and allow for some tactical control, but there could be more of them. Monster Moos takes the familiar set collecting mechanic, throws in a dash of special actions, and stirs it up with some light tactical choices. With simple rules, a clean turn structure, and a uniquely fun theme, kids will be stampeding for more – and their parents will enjoy tagging along for the ride. For families and social gaming gatherings that include children, this title will deliver. 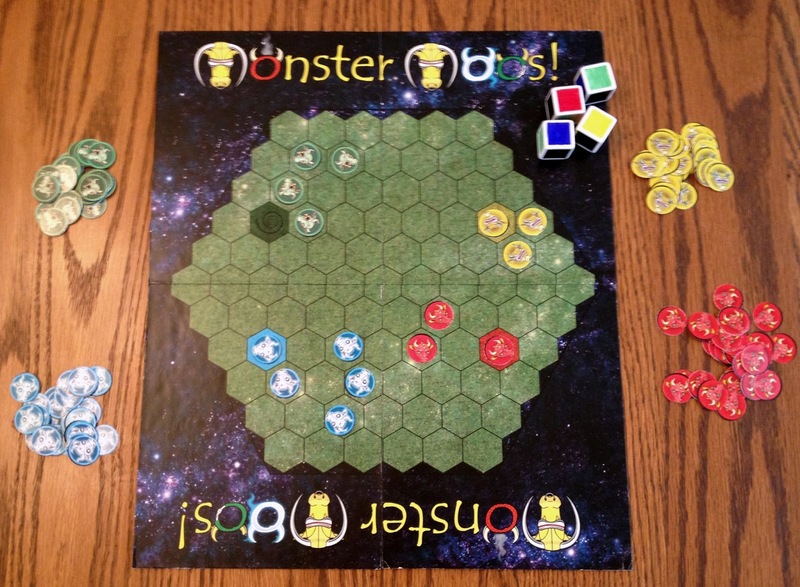 Monster Moos will run on Kickstarter through May 31st. You can get the game for a reasonable $25 contribution, with other perks possible at higher funding levels. If you’re interested, grab your laser lasso and boom stick and mosey on over to the campaign page to rustle up a copy. Just don’t step in the ectoplasm. 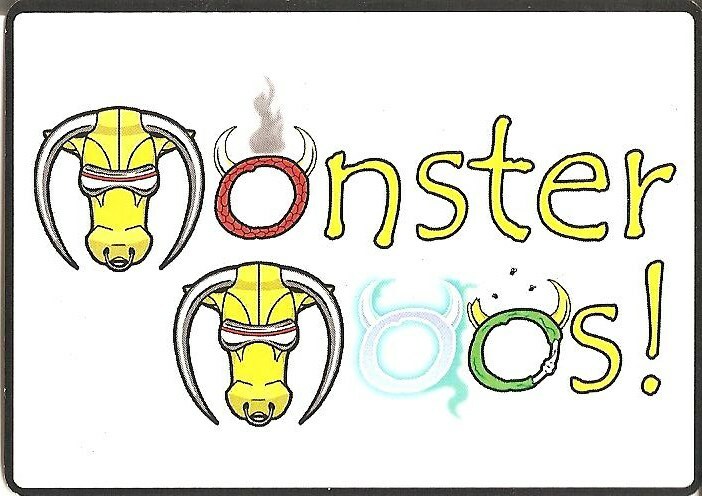 iSlaytheDragon would like to thank Blank Wall Games for providing a prototype of Monster Moos. Next Article Review: The Great Heartland Hauling Co.